With more conservative CPU and GPU configurations than last year's ThinkPad W540, the W550s provides impressive performance with the added bonus of longer battery life – all in a lighter, thinner body. Compromising just a little on power, the W550s delivers double the battery life of last year's model in a slightly more travel-friendly package. If you don't need the full quad-core processing performance of last year's ThinkPad W540 workstation, you can still get workstation-class power in this year's ThinkPad W550s. Positioned as a slimmer cousin to the ThinkPad W540 and this year's ThinkPad W541 in Lenovo's lineup, the W550s comes packed with Intel's fifth generation Broadwell processor and a discrete graphics chip in a more portable package. This Ultrabook-class laptop, priced starting at $1,133 (£765, AU$1,455), packs plenty of punch to compete with heavyweight workstations, with features including an optional 3K touchscreen display, desktop docking, longer battery life, military specification testing for durability and plenty of ports. With a 15.5-inch high resolution screen, the ThinkPad W550s has many rivals. Namely, it competes against Dell's $2,234 (£1,505, AU$2,862) Precision M3800 workstation with a 4K display and Nvidia Quadro K1100M graphics and the more powerful, $2,079 (£1,400, AU$2,665) Dell Precision M4800 with a 4K touch panel and quad-core Haswell processor alongside an Nvidia Quadro K2100M GPU. Other notable competitors include HP's $2,999 (£2,020, AU$3,845) ZBook 15 G2 with a QHD+ resolution display and Quadro K2100M graphics, and MSI's $2,649 (£1,785, AU$3,395) WS60 with 4K display along with a quad-core Haswell processor and Quadro K2100M graphics. If you're looking at OS X, Apple's $2,499 (£1,685, AU$3,205) MacBook Pro15-inch with Retina display and Nvidia GeForce GT 750M graphics is also an excellent contender. If you love Lenovo's understated aesthetics from its ThinkPad range, you won't be disappointed here. All of the power of the ThinkPad W550s is packed into a simple black box with straight edges and subtly rounded corners. Even though the ThinkPad W550s looks like a plastic brick, don't be fooled by its construction. The components are protected by a sturdy roll cage, metal skeleton, and reinforced with what Lenovo describes as "satellite-grade" carbon fiber. With one-third the weight of aluminum, the use of a carbon fiber shell helps keeps the W550s light while being more shock absorbent at the same time, in case you drop the notebook. I can't attest to the shock absorbent nature of the design as I didn't perform any drop tests, but the overall build quality is solid with minimal creaks and no flexes. Compared to the more powerful ThinkPad W541 on the market, the compact 15 x 10.2 x 0.92-inch (38.1 x 25.9 x 2.34cm) dimensions of the 5.47-pound (2.48kg) ThinkPad W550s make it easier to travel with. Even though the reductions in weight from 5.57 pounds (2.52kg) and thickness from 1.1 inches (2.79cm) from the ThinkPad W540 seem small, I found that it makes a huge difference when you're carrying the laptop in a shoulder bag all day. The compactness of the W550s is even more dramatic when compared to a few of Lenovo's rivals. The Dell M4800 is about 50% thicker and almost a pound heavier at 6.35 pounds (2.88kg), while HP's ZBook 15 weighs 6.13 pounds (2.78kg) with a 1.2-inch (3.04cm) thick frame. Still, there are thinner and lighter workstations on the market. The 15-inch MacBook Pro with Retina display is both lighter at 4.46 pounds (2.02kg) and slimmer at 0.71 inches (1.8cm). Dell's M3800 workstation is even more dramatic, with an even lighter 4.15-pound (1.88kg) weight. Although the M3800 has the same 0.71-inch thickness as Apple's laptop, Dell tapers the front to a slim 0.31 inches (0.79cm), making it feel thinner than it really is. With the ThinkPad W550s, Lenovo opted for a dual-finish design. The top lid of the laptop has a soft-touch finish. The rubberized material makes the laptop easier to grip, but is a magnet for dirt and fingerprints. Lifting open the top lid reveals a spacious keyboard deck and large 15.5-inch display. The lid is attached to the body with sturdy, square stainless steel hinges. The hinge is solid enough that hard taps on the touchscreen display didn't cause the screen to tilt back. 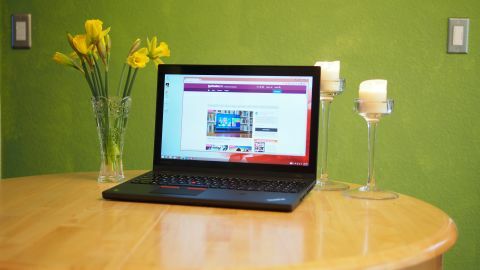 Compared to the 14-inch full HD display on the ThinkPad T450s that TechRadar reviewed recently, the larger footprint of the W550s gives you more screen real estate and pixels to work with, making it easier to juggle multiple windows and stay productive. Even though the large screen makes video editing and photo touchups an immersive experience, I wish Lenovo had opted for a taller screen. The 16:9 aspect ratio feels a little constraining when working with large Excel spreadsheets and Word documents, and a 16:10 display would certainly feel roomier. Unlike the lid, the keyboard deck, palm rest, under carriage and sides are not coated in the soft-touch finish. Similar to the Lenovo ThinkPad T450s, I found the matte plastic more resistant to attracting fingerprints, oils and dirt over extended use. A bevy of ports on both sides of the ThinkPad makes it easy to connect peripherals while traveling without the optional docking station. With both VGA and mini DisplayPorts on the W550s, users can connect two displays simultaneously to the W550s. The optional docking port on the undercarriage of the laptop allows for more expandability with additional USB ports, HDMI, DVI-D, and DisplayPort. Typing is very comfortable on the spill-resistant, backlit keyboard. The ThinkPad W550s comes with responsive keys that offer plenty of travel. Compared to the MacBook Pro, there is more key travel on the concave keys of the ThinkPad W550s, but the keys of the Lenovo sound more dampened. In my use, key presses on the W550s sound softer without the clickiness of the MacBook keys. For those who live inside Excel or deal a lot with numbers, there is a dedicated number pad just to the right of the keyboard. This is an advantage over consumer-centric notebooks or those intended for creative professionals, like the 15-inch MacBook Pro with Retina display. Compared to a desktop keyboard, the keys on the number pad are slightly narrower on the ThinkPad W550s, but not quite as narrow as the keys on the MSI WS60. Because of the inclusion of the number pad, both the keyboard and the trackpad were skewed a little to the left in their placement relative to the screen. Though the overall typing experience is excellent, ergonomics may be hindered depending on how you use the notebook. When used as a laptop on my lap, I found that my body was slightly turned towards the left to accommodate for the off-center position of the keyboard. When used on a desk, this was less obvious.